I didn’t take a photo last night while at dinner, even though I knew I planned to tell you a story about it. So, this photo is of some random place I’ve never been. I simply wasn’t thinking of you guys or a photo at dinner. I blame the wine. But you know… sometimes I think Enough already, Lisa. You do NOT have to snap a photo every godforsaken place you go. So, instead you get one that looks like I should have been THERE. My neighborhood bistro / bar La Vecchia is pretty cool with the right photography, too, but I definitely want to go to the place in THIS photo. Vecchia has a rockin happy hour, so the bar is always packed (which is where you must sit to get the happy hour deals). You guys, they have about three SALAD options on their happy hour menu for about 6 bucks (plus their cab-sav is pretty great). I am obsessed with Vecchia as a result and almost always want to go there. It’s when they bring the hot baked bread and olive oil which really tastes best when paired with rigatoni bolognese, that things go south. You guys! Dangle that yumminess in front of me, and all thoughts of living healthy are like – “What’s your name? And… you would be?” – basically forgotten. Which is why I do not always go to Vechhia. Sony Publishing bought EMI in partnership with David Geffen and some other really rich guys. We all really need at least one of those. Better yet. Let’s BE one of those. God knows I plan to be “a really rich guy” (you know what I mean) one day. Such a funny little experience makes me think perhaps this walking into a bar thing should become a regular thing. 6 Responses to "I walked into a bar"
You just crack me up . . . again! 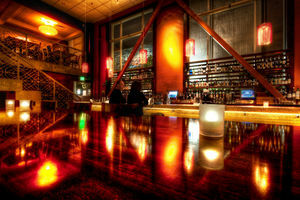 I STILL love the photo of the bar that you’ve never been too – beautiful photo – ha ha! So . . . you went to a bar ALONE? Too gutsy for me, but at least you got a good laugh while you were there! Wakajak- I love ya! Thank you – and NO…it wasn’t really JUST a bar. it was a restaurant with a bar, but this place, the bar is the hot commodity because of the happy hour, and it’s around the corner from our place… so yes, I go alone. Love it. I think it’s so important to talk to strangers. I know, I know, we tell our kids all the time “don’t talk to strangers” but if you don’t, how else could you learn all the wonderful things you learn about people and the world? While I haven’t had the guts to go to a bar alone, I have done restaurants and other venues… always jump at the chance to talk to people when I can. I know the post is called I walked into a bar, but it really is a great restaurant with a bar out in the open as part of it. You must sit at the bar to get the happy hour though. Thanks E! It is so easy to get into trouble and even easier to see a whole new meaning to somebody’s phrase. Great post.